The newly engaged and happy couple met the media for a short press conference and photo session, where we learned among others that Prince Carl Philip had proposed the same morning and that Ms. Hellqvist had been taken by surprise. They had been waiting for this day for such a long time... According to today's press, the couple met in 2009, became a couple in early 2010 and moved in together in 2011. She seems to have been welcomed by the royal family from the start and have attended several royal events, including Princess Madeleine’s wedding in 2012 and Princess Leonore’s christening earlier this month. From the released CV, today’s newspapers and Dt.se we learn that Sofia Kristina Hellqvist was born at Täby (outside Stockholm) on 6 December 1984, but grew up in Älvdalen in Dalarna. She is the second daughter of Erik Hellqvist and Marie Hellqvist, née Rotman. Her big sister is named Lina, while her younger sister is Sara. Sofia attended primary school at Älvdalen and the local Montessori school and studied at the high school in Vansbro. I cannot find too many details about her family, but Svensk Damtidning published a survey of her family in no. 14, 2013 (which I haven't read). Erik was born in Denmark and works or has worked at the local post office, while Marie, who comes from Älvdalen originally, used to be an active member of the Liberal People’s Party. I am sure we will get more details and more accurate information later. According to the information released by the court, Sofia has studied accounting with computer application, specialising in business development, at the Institute of English and Business in New York. Sofia has also studied various courses such as global ethics, child and youth science, children’s communication and the UN Convention on the Rights of the Child in theory and in Swedish practice at Stockholm University. During her time in New York, Sofia also studied at YTTP, Yoga To The People, to become a certified yoga instructor. She was also involved in setting up a yoga centre. During September and October 2009, Sofia carried out voluntary work in Ghana. She visited orphanages and helped build a centre for women. In 2010, Sofia founded the organisation Project Playground, together with her friend Frida Vesterberg. Project Playground is a non-profit organisation that helps vulnerable children and young people in areas and townships outside Cape Town, South Africa, primarily in Langa, which is the oldest township in the area. Project Playground strengthens children’s personal and social development via support programmes and organised activities. With a focus on children and young people’s leisure time and the individual, Project Playground creates a safe platform and meeting place with activities and programmes, run by adults that act as leaders and role models. The business has a total of 29 employees (26 in South Africa) and is one of the largest employers in the township of Langa. Sofia is President of Project Playground, and Frida Vesterberg is Vice President. So far, so good. But the future Princess Sofia of Sweden has a past. Maybe not as wild as many would claim, but there are photos out there, from the time she was a glamour model and participant in a reality show. She surely regrets some of the choices she made when she was young. The reactions of today’s news have obviously been mixed, as one could expect. You can read comments by the more Catholic than the Pope kind of people who find Ms. Hellqvist totally unsuitable to marry into the Swedish royal family and on the other side comments by the royalty is a fairytale kind of people who believes love conquers everything and nothing else matters. The republicans are always bothered by the cost of the wedding, and then again there are many who wouldn’t care less. If the monarchy falls, it will most likely not be because of Prince Carl Philip’s choice of bride. Some will regard her as a gold digger and worse, while others prefer to talk about how they met at a party and fell in love. Regardless, the couple made a great impression at the press conference today. It is too early to say what impact the engagement and wedding next year will have on the support of the monarchy. She will most likely grow into her role and perform her duties well. She will be accepted by the majority, while the skeptics will never forget. Sofia Hellqvist seems to be a charming and warm-hearted person who will be of great support to her husband. Those who are critical of the union and want someone to blame, should go after Prince Carl Philip, who by his more or less controversial choice of a woman «with a past» is challenging the bedrock the monarchy is leaning on and exposing the royal house to more criticism and negative headlines. Something the royal house doesn’t really need. It is kind of sad, though. An engagement is supposed to be a celebration not only of a young couple’s love, but also of the monarchy itself. Instead we end up with mixed feelings and debates. Constitutionally speaking, the king and the government have given consent to the marriage, cf. article 5 of the act of succession, just as expected. The Government gave its approval yesterday by the way. Upon marriage Sofia will become Princess of Sweden and Duchess of Värmland with the style of Royal Highness, and any possible children will be Prince or Princess of Sweden just like their cousins Estelle and Leonore. Updated on 30 June 2014 at 10.05 (minor corrections about Sofia's parents, link added). Are you interested in genealogy and/or heraldry? Why don't you come to Oslo between 13th and 17 of August this year, where the 31st International Congress of Genealogical and Heraldic Sciences takes place? The theme of the congress is "Influence on Genealogy and Heraldry of Major Events in the History of a Nation", a theme chosen because of the two major jubilees which are marked in 2014 - the 200th anniversary of the Norwegian Constitution and Oslo's 700th anniversary as the capital of Oslo. Whether Oslo really could be defined as a capital 700 years ago or not has with good reasons been a subject of discussion, but the anniversary is nevertheless being marked, although not in the same style as the 17th of May anniversary. Anyway, there are many interesting topics being presented during the congress, including themes covering royalty and nobility. The timing and venue for each presentation has now been decided, and these can be seen on the Congress website – Program. Under Presenters you can see the names of the speakers and title of the presentations, and clicking further on the individual names takes you to a synopsis of the talk. In addition to general registration, it is possible to register for individual days for talks of particular interest – contact the Congress at post@congress2014.no for details. The organizers behind the congress is the Norwegian Genealogical Society (Norsk Slektshistorisk Forening) and the Norwegian Heraldry Society (Norsk Heraldisk Forening). The blazon of the emblem is as follows: Shield: Azure a Tree eradicated Argent. 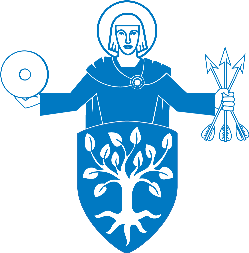 Supporter: Issuant from behind the Shield Saint Hallvard (Oslo’s patron saint) Azure with a Millstone resting in Dexter Hand and holding three Arrows in Sinister Hand, all Argent. (Source: Slektshistoriewiki - The Norwegian Genealogy Wiki). The 31st International Congress of Genealogical and Heraldic Sciences Oslo 2014 is under the distinguished patronage of His Majesty King Harald V of Norway. Hope to see as many of you in Oslo in August this year! Long live King Felipe VI! The abdicacion bill was approved in the Spanish senate yesterday (233 in favour, 5 voted against, 20 abstentions). In a ceremony at the Royal Palace tonight King Juan Carlos signed the abdication bill into law (which was also countersigned by President of the Government Mariano Rajoy). The act will come into effect "from the date of its publication in the Official State Gazette",* i.e. at midnight. 160 people attended the ceremony, including King Juan Carlos, Queen Sofia, the Prince and Princess of Asturias (soon-to-be King Felipe VI and Queen Letizia), Infanta Leonor, Infanta Sofia, Infanta Elena, the King's sisters Infanta Pilar, Duchess of Badajóz and Infanta Margarita, Duchess of Soria (the latter with her husband Carlos Zurita, Duke of Soria), the Duke and Duchess of Calabria (the king's first cousin Infante Carlos and his wife Anne, née d'Orleans), the king's aunt by marriage Infanta Alicia, as well as former King Constantine and Queen Anne-Marie of the Hellenes and the former King Simeon of the Bulgarians. On Thursday morning, 19 June, King Felipe VI will take the oath in the proclamation ceremony before both houses of Parliament. Besides the new king and queen and their daughters the Princess of Asturias (Leonor) and Infanta Sofia, also Queen Sofia, Infanta Elena, Infanta Pilar and Infanta Margarita and members of Queen Letizia's family will be present. King Juan Carlos has decided not to attend so that the new king will get all the attention. The king and queen will observe the military parade from stairs of the Congress building before being driven to the Royal Palace where they will greet the Spanish people from the balcony. The Princess of Asturias, Infanta Sofia, King Juan Carlos and Queen Sofia will also be present. At 1 p.m. a reception will be held attended by around 2000 people. The English edition of El Pais has given a nice survey of tomorrow's events. In addition the Royal Court has issued a 90 pages long document with all the details about the abdication and the ceremony on Thursday (for the Spanish version, which has 3 more pages, go here). *Postscript 23 June 2014: It should be added that I based the translation of the abdication act on the draft bill published by the Government on 3 June 2014, where the text of the final provision said «This Law shall come into force as from the date of its publication in the Official State Gazette".» In the translation at the Royal Court’s website the final provision reads «This organic law shall take effect when it is published in the "Official State Gazette".» The latter translation was made available after the act was published in BOE. There is obviously a minor, but still significant, difference between the two translations. The former translation would mean that the then Prince of Asturias became king (as Felipe VI) at midnight on 19 June regardless of when the act was published that day, while the latter clearly says that the succession started from the time of publication. Not much difference in time, though, as the act was published two minutes after midnight. Even though my understanding of Spanish is limited, it seems to me that the translation at the Royal Court’s website is more accurate. The draft bill’s final provision in Spanish said that «La presente Ley entrará en vigor en el momento de su publicación en el Boletín Oficial del Estado".», while the published act read «La presente ley orgánica entrará en vigor en el momento de su publicación en el «Boletín Oficial del Estado». » The only difference is that the word «orgánica» was added during the process. Updated on Monday 23 June 2014 at 22:20 (postscript added, last time on Thursday 19 February 2015 (typo corrected). Their Royal Highnesses Grand‐Duke and Grand‐Duchess of Luxembourg are very pleased to announce the birth of Prince Félix and Princess Claire’s first child. The baby girl was born on 15 June 2014 at Maternité Grande‐Duchesse Charlotte in Luxembourg. The little Princess will be named Amalia, Gabriela, Maria Teresa. On birth, the baby weighed 2,950 kilograms and measured 50 cm. Prince Félix was at the side of his wife in the delivery room. Her Royal Highness and her baby are both doing well. The Grand‐Duke and the Grand‐Duchess as well as Mr and Mrs Lademacher and both families are delighted with the news. The exact time of the birth was for some reason not included in the announcement. Prince Felix is the second son of Grand Duke Henri and Grand Duchess Maria Teresa of Luxembourg. He married Claire Lademacher on 17 September 2013 (religious celebration 21 September 2013). The pregnancy was announced by the court on 14 January 2014. HRH Princess Amalia of Nassau, who is third in line to the Grand-Ducal throne, is the third grandchild of the Grand Ducal couple. Prince Félix' younger brother Prince Louis and his wife Princess Tessy have two boys – Prince Gabriel (b. 2006) and Prince Noah (b. 2007). I am not sure what has motivated the choice of Amalia as the baby's call name, but one can at least find several examples of Amalie or Amalia in the various Nassau lines. The other names (Gabriela Maria Teresa) are surely after Princess Amalia's grandmothers. The Spanish lower house, the Congress of Deputies, processed the abdication draft bill today. Some representatives used the event to mark their opposition to the monarchical form of government, but as the major parties voted in favour of the bill, everything went as expected. For the record, 299 representatives were in favour, while 19 voted against. In addition there were 23 abstentions. Sole Article. Abdication of HM King Juan Carlos I de Borbón. 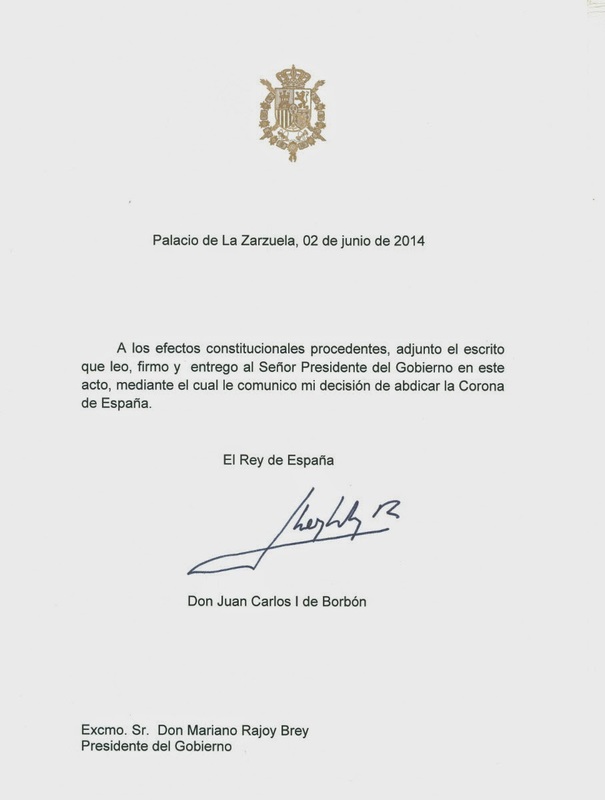 HM King Juan Carlos I de Borbón abdicates the Spanish Crown. The abdication will become effective as from the entry into force of this Constitutional Law. Sole final provision. Entry into force. The bill will now move on to the Senate, where it will be processed on Tuesday 17 June 2014 at 4 p.m. The following day it is expected that King Juan Carlos will sanction and promulgate the abdication law in accordance with the Constitution Article 62. But as the text of the bill suggests, the law will not come into force until the date of its publication in the Official State Gazette. * Nothing is official yet, but it seems that Felipe will take the oath on Thursday 19 June 2014. According to El Pais (3 June 2014), "The exact date when the law goes into effect is set to coincide with the proclamation of the new monarch, as there can be no transitional period. In the meantime, “the king continues to be the king to all effects and purposes,” said an expert in royal affairs." I find this claim a bit odd. If Juan Carlos had died in his sleep still being the king, there would most certainly have been a transitional period, so why should there be a difference when the king abdicates and becomes "constitutionally dead"? We will surely obtain more information as we get closer to the main events next week. Updated on Wednesday 11 June 2014 at 22.35 (press release from La Moncloa added), last time on Monday 23 June 2014 at 22.20 (postscript added). The christening of Princess Leonore of Sweden, the daughter of Princess Madeleine of Sweden and Chris O'Neill, took place at the Royal Chapel of Drottningholm Palace outside Stockholm today, 8 June 2014. The christening coincided both with Pentecost as well as the first wedding anniversary of Princess Madeleine and Mr. O'Neill. Princess Leonore, Countess of Gotland was born at New York City, USA on 20 February 2014, and is fifth in line of succession to the throne of Sweden. With such a great weather I preferred to stay outdoors rather than watching the televised ceremony, so I am not able to give a personal review of today's events, but here are the main facts. The ceremony was officiated by Archbishop Anders Wejryd assisted by Chief Court Chaplain of the Royal Court and Bishop Emeritus Lars-Göran Lönnermark and Vicar of the Royal Court, Court Chaplain, Michael Bjerkhagen. The latter two also officiated at the wedding of Princess Leonore's parents, Princess Madeleine and Chris O'Neill, on 8 June 2012. The arms and monogram of Princess Leonore were also published in connection with the christening. The four quarters of the arms show the lesser coat of arms of Sweden (field 1 and 4), the arms of Folkunga (field 2) and in field 3 the arms of Gotland (Princess Leonore is also Duchess of Gotland), while the inescutcheon shows the arms of the House of Bernadotte. The arms are crowned by the princess crown. The monogram consists of the initial L and a princess crown above. The heraldic artist Henrik Dahlström has designed the arms, while the monogram has been designed by Vladimir A. Sagerlund. Both were approved by the king. Sagerlund also designed the arms and monogram of Princess Estelle. It was also announced that King Carl Gustaf had bestowed upon Princess Leonore the Royal Order of the Seraphim in connection with the christening. All the press releases connected to the christening can be read here. Updated on 9 June 2014 at 13.20 (names of heraldic artists corrected). See also the website of the Congress of Deputies, where the bill has been registered (Proyecto de Ley Orgánica por la que se hace efectiva la abdicación de Su Majestad el Rey Don Juan Carlos I de Borbón. (121/000098)). The vote on the bill (in both chambers) is expected to take place in mid June. The organic law (the abdication act) will then come into effect as soon as it has been published in the Legal Gazette (BOE). Still waiting for confirmation, but as of now it seems that the new king, Felipe VI, will be proclaimed and will take the oath (in accordance with the Constitution Article 61) on 18 June 2014. Postscript 6 June 2014: According to El Pais 6 June 2014 the proclamation ceremony will take place on Thursday 19 June 2014. Uupdated on Wednesday 4 June 2014 at 09.00 (typo corrected), last time updated on 6 June 2014 at 15.15 (postscript added). Andre lands grunnlover kan være en utfordring å forstå. Men man må likevel kunne forvente at norske journalister gjør hjemmeleksen sin. Dessverre har NTB slurvet i sin dekning av kong Juan Carlos' beslutning om å abdisere og lovprosessen som vil finne sted i kjølvannet av beslutningen. Den spanske grunnloven hadde ingen paragraf som omhandler abdikasjon, og derfor må grunnloven endres før Kong Juan Carlos (76) kan overlate tronen til kronprins Felipe (46). Den spanske regjeringen godkjente en grunnlovsendring i et ekstraordinært møte tirsdag, og den må nå vedtas i nasjonalforsamlingen, melder NTB. Abdications and renunciations and any doubt in fact or in law that may arise in connection with the succession to the Crown shall be settled by an organic act. Med andre ord, Grunnloven har så absolutt en paragraf som omhandler abdikasjon! Tirsdag 2. juni 2014 offentliggjorde kong Juan Carlos sin beslutning om å abdisere i form av et signert brev til den spanske statsministeren, Mariano Rajoy. I dagens regjeringsmøte ble det derfor besluttet å fremme et lovforslag (Proyecto de Ley Orgánica por la que se hace efectiva la abdicación de Su Majestad el Rey Don Juan Carlos I de Borbón. (121/000098)) om abdikasjonen i det spanske parlamentet (Cortes Generales). Med andre ord, det vedtas en såkalt "organisk lov" ("konstitusjonell lov") med hjemmel i Grunnloven, men dette er ikke en grunnlovsendring, som krever en helt annen prosedyre. Etter vedtaket i parlamentet trer loven i kraft så snart den er publisert i det spanske Lovtidend (Boletín Oficial del Estado, forkortet til BOE), som forklart av det spanske SMK i dag. Juan Carlos vil da være "konstitusjonelt død" og sønnen Felipe VI overtar tronen umiddelbart, men kan først utøve sin kongegjerning når han har avlagt eden. Mange ulike datoer har vært nevnt, men det ser ut til at stemmegivningen i Congreso de los Diputados (deputerkammeret) vil finne sted fredag 13. juni, før loven går videre til Senatet. Per i dag tyder mye at kong Felipe (jf. Grunnloven artikkel 61) vil bli proklamert og vil avlegge eden 18. juni, men den endelige datoen er ennå ikke offisielt fastsatt. Alt dette kunne NTB enkelt ha funnet ut av selv hvis man hadde tatt seg tid til å oppsøke offisielle spanske kilder (som Statsministerens kontor og Deputerkammeret) og den engelske versjonen til El Pais mfl. Leserne fortjener bedre enn det NTB har servert i dag. Etterskrift 4. juni 2014: Ifølge en pressemelding på Deputerkammerets nettside vil behandlingen i Deputerkammeret finne sted onsdag 11. juni. Etterskrift 6. juni 2014: Ifølge El Pais 6. juni 2014 vil proklamasjonen og edsavleggelsen finne sted torsdag 19. juni 2014. Oppdatert onsdag 4. juni 2014 kl. 11.00 (etterskrift tilføyd); sist oppdatert fredag 6. juni 2014 kl. 15.15 (etterskrift tilføyd). The Spanish Royal Court most surprisingly announced this morning that King Juan Carlos, who has reigned since 1975, has decided to abdicate the throne. The decision was communicated to prime minister Mariano Rajoy in form of a signed letter (see picture above). Later the same day the king appeared on Spanish TV explaining his decision. In accordance with the Constitution of Spain Article 57,5, the Government will soon propose a bill to the Parliament (Cortes Generales). The so-called "organic law" (constitutional law) will have to be passed by both houses and will come into effect when it has been published in the legal gazette. According to the Spanish media today the process is expected to take place before the end of June. The newspaper El Mundo outlines the process here (in Spanish). King Juan Carlos' only son, Felipe, Prince of Asturias, will succeed the throne as Felipe VI. Although there has been some speculations over a possible abdication for some time, following the scandals that have surrounded the royal house the last few years, most people were taken by surprise by the news this morning. The decision is by many commentators interpreted as an effort to save the monarchy, given its declining popularity. The king's poor health has also been pointed out as a main reason. It is kind of sad that King Juan Carlos' reign ends this way, leaving the throne during such an institutional crisis. He has on several occasions demonstrated his lack of judgment both in his public role and in his personal life. Fortunately his successor seems to be much more in touch with the lives of the Spaniards and will hopefully give the institution the "new energy" it needs. But despite all the scandals, King Juan Carlos will have to be remembered for his role in Spain's transition to democracy following the Franco dictatorship and for the way he handled the coup in 1981. See Prime Minister ("President of Government") Mariano Rajoy's comments here and the statement (in Spanish) of the President of the Congress of Deputies, Jesús Portada, here. Updated on Tuesday 17 June 2014 at 09.45 (change of url for one link).